Eliminating Waste in Our Lives: Lessons from the Toyota way…. As humans, we have always known we produce waste. Every time we eat food, there are two visible types of waste (immediate trash and longer term liquid and solid outputs). We also talk about wasted time, wasted effort, wasted energy, wasted money., wasted opportunity….In industrial terms, we found crafting and tradesmanship (artisanry) to be too scattered for rapid production so we turned to assemblage and mass manufacturing governed by scientific management techniques (Frederick Taylor). Now artisanry commands a price premium but that is another topic all together. Once we had standardized processes, we had data to see that there was a lot of variation in quality. Eliminating this variation became paramount to remaining competitive (W Edwards Deming). Combining quality and efficiency at a mass production level is an art that was mastered by Toyota. Lean production (aka just-in-time production) focuses on maximizing the amount of resources directed towards value creation and eliminating non value related activities. (additional information on Lean Thinking) While Lean has transcended manufacturing (see below), it is only part of the Toyota Philosophy. The Lean philosophy can be summarized as focusing on the people doing the work and finding ways to improve the processes and level of performance of the work itself. Continuous Improvement and Continuous Learning are inherent in this approach. The methodology for eliminating waste is known as DMAIC (Define, Measure, Analyze, Improve, Control). It often helps to have a tangible example beyond savings in dollars or time. Work with business partners in research [learning] and manufacture [production] to achieve stable, long-term growth and mutual benefits, while keeping ourselves open to new partnerships. Using these principles as a basis, what DMAIC steps can we take to eliminate the waste in how we educate children, how we create jobs, how we practice work/life balance, how we establish romantic relationships (yes, there is lean dating)? Feel free to post comments and/or links! Some of us never get enough punishment which is why I decided to start a PhD Leadership degree at the age of 40. Needless to say it is an adjustment. One of the things I vowed to myself before starting was that I would not loose touch with the outside world while in the program. Hence, this weekend I decided to try and catch up on current events only to discover that all universes end up colliding with each other. In Statistics class, we are reading book Dirty Rotten Strategies: How We Trick Ourselves and Others Into Solving the Wrong Problems Precisely. The book goes beyond Type I and Type II errors into what the authors describe as Type 3 and 4 errors. Type IV: we intentionally force others into solving the wrong problems precisely, to their detriment and for our gain and benefit. The definitions do not imply malice, just things to be careful about (although authors would probably disagree with me on this hence book title). While listening to the Mukerjee interview, he describes the evolution of thought with respect to radical mastectomies and I saw it as a clear example of a Type IV error. According to Mukherjee, proponents of the radical mastectomy procedure inflicted damage on thousands of womens bodies until patients started demanding empirical evidence which showed there was no difference in benefit (i.e. nothing gained) between regular mastectomy, radical mastectomy and lumpectomy plus radiation. Hence, those who underwent the procedure had been intentionally convinced to solve the wrong problem precisely (i.e. instead of focusing on curing cancer the focus became the removal of the breast and surrounding tissue in a very precise manner). In addition, Mukherjee points out that the term “radical” in and of itself caused group think (i.e. what patient when trying to fight for his/her life would refuse “radical” treatment?). This group think enabled the solving of the wrong problem to continue until a select few asked for what the other book we are reading The Black Swan: The Impact of the Highly Improbable refers to as silent evidence (i.e. data proving there was no benefit) to be revealed. It would be hard to say that doctors practicing the radical mastectomy approach were maliciously trying to mutilate women. What they failed to do was verify their assumptions were correct before inflicting permanent damage. To put the group think into philosophical terms, they were blinded by their own semiotics (cultural signs, in this case medical culture, such as nomenclature and conventions, aka biases, that reinforced their belief the radical mastectomy approach was correct, i.e. caused detection errors). All this begs the question: how do we avoid such egregious errors, especially as we practice personal leadership (leading through our own behavior and beliefs)….???? Meanwhile, any thoughts or comments on the subject of how to avoid such errors are most welcome! This 18min video is a must see TED talk! 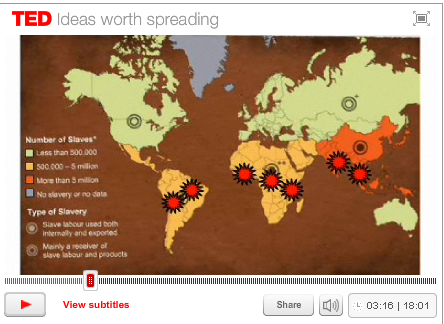 27 million people (in 2010) facing same conditions as during height of the slave trade (i.e. forced to work under constant violence/threat of violence and with no pay). This is double the number of slaves that came out of Africa during the entire transatlantic slave trade. Problem is found everywhere except for Greenland and Iceland. People are not usually kidnapped but rather living in very poor conditions and recruited with the promise of a paying job. Locations with high concentrations of slaves are also locations with extreme environmental destruction. This only occurs in places where the rule of law is absent. Slavery is illegal in every country and has been pushed to the edges of our global society. 27 million people = smallest fraction of the global population to ever be in slavery. The $40 billion that they generate into the global economy every year also equals the smallest proportion of the total global economy (smallest proportion also in historical terms). We have the resource capability to completely eradicate slavery from human history within our lifetime. This money would not be spent to buy people out of slavery because this would reward the enslavers. Money would be spent on the process and technical assistance providers who help slaves achieve liberation and rebuild their lives. The process usually takes between 2 to 5 years. Those who are liberated become empowered over their economic futures and local economies begin to flourish because they are now working for their own benefit. Moral rectitude and peace of mind/human dignity. (Not mentioned in the Talk but, arguably, if the worst environmental degradation is being accomplished through slave labor then by ending slavery we are also ending the environmental degradation). Lots more interesting facts and issues raised in the video…. It seems like everywhere you turn these days, there are laments about the failure of our organizations. Government institutions, schools, banks, multi-national corporations, poverty relief/social service organizations, NGO’s, chose a sector and you’ll find widespread bemoaning. The solution – it must be a leadership problem so let us focus on the leaders! Leaders mold an organization; they inspire others; they set the tone; they lead by example. Typically this leadership role is relegated to managers, executive staff and the Board of Directors. If an organization is failing, it is entirely their fault. However, this always leaves me to ask myself, what about the rank and file? In the case of corporations, it would be everyone down to the cleaning staff. In the case of government it is the average citizen. If all our problems are because of our leaders/lack of, what are WE/US/I responsible for? What can we do to make change in our daily lives or to improve things so they are the way we want them to be? This is the problem with leadership blaming. It makes one a helpless victim of circumstance which in turn fosters frustration, resentment, anger, and outrage. What if, instead of examining leaders, we take a close look at the institutions we have created? Not just a current look, but an historical look as well. So now we see that regardless of one’s beliefs around profit-making companies versus non-profit companies, the legal entity under which they operate is essentially the same: a corporation. How doe s this have any bearing on our current problems? We lament that corporations have no souls. We forget: THAT IS WHAT THEY WERE DESIGNED TO BE – SOULLESS ENTITIES! “Mr. Price argued that, in effect, there are two separate sets of persons in whom authority to activate the company itself resides. Quoting the well known passages from Viscount Haldane L.C. in Lennard’s Carrying Co Ltd v Asiatic Petroleum Co Ltd  A.C. 705, he submitted that the company as such was only a juristic figment of the imagination, lacking both a body to be kicked and a soul to be damned. So, if it is clear we have designed the legal entities under which we organize to have no souls, why is it that we then blame the leaders of our corporations? See the problem? We design organizations to have no souls. We fill these organizations with humans. As law-abiding citizens, these humans, especially those charged as directors and managers, must follow the corporations laws. These laws are designed to keep the organization soul less and yet, we then blame the directors and managers for acting this way. Don’t believe me? If your organization has ever been faced with a questionable or moral/ethical situation for which there is little or no precedent, as a director or manager, you call your attorney. What will your attorney tell you to hold as your first responsibility? Protect the organization/corporation. Not protect your humanity, not protect those who might be affected by your actions, nope, you must first protect this soulless entity which you are contractually obligated to operate in a responsible manner. This reference highlights that the duties of the Director of any corporation “are owed to the company itself, and not to any other entity” http://en.wikipedia.org/wiki/Directors’_duties In other words, the duties are not owed to society, to the neighborhood, etc. they are owed strictly to the soulless entity. The Directors (aka Board of Directors, set the tone for the entire organization). Lawyers are always warning both directors and officers of the extreme personal liability and risk one invites if one “pierces the corporate veil” http://en.wikipedia.org/wiki/Piercing_the_corporate_veil While this reference seems simple and short enough, when the lawyers come in and talk, one is left with quite the deer in headlights look and paralyzed by the fear that something as simple as shaking someone’s hand could “pierce the corporate veil” or bring in unnecessary liability. Why, because there is always someone, somewhere who as sued a similar organization for the most obscure issue known to mankind! Taken from this perspective, it is actually a testament to the human spirit that we have corporate ethics and responsibility at any level whatsoever! The herculean task of making a soulless entity behave as if it does have a soul has quite the Sisyphus ring to it. Yes, we have made some strides but would it not be much easier to organize ourselves (both in terms of legal parameters and our activities) in a manner that puts the soul first? Our current corporate legal history dates back to Roman times http://en.wikipedia.org/wiki/History_of_corporate_law . What we did before this I have not been able to determine. What is interesting to note is that sometime during the Roman era, while we do not know by whom or why, it was decided that this was the best way to proceed and we have been replicating and expanding the system ever since. Is it then not possible to create, replicate and expand a new system? There has been much recent debate over the Supreme Court’s decision to allow Corporations to lobby Congress (Citizen’s United v Federal Election Commission). However, as was the case with Enron and now with Goldman Sachs, the legislative history of treating corporations as individual beings also means that the infamous soulless corporation can be brought up on criminal charges just like a regular person can. Such prosecutions can destroy a corporation as summarized by this Washington Post article. I share the opinion expressed by veteran regulator William K. Black in his April 23, 2010 interview on Bill Moyer’s Journal. “…[I]n terms of that Supreme Court decision, if corporations are going to be just like people, let me tell you my criminologist hat. Then let’s use the three strike laws against them. Three strike laws, you go to prison for life, if you have three felonies. How many of these major corporations would still be allowed to exist, if we were to use the three strike laws, given what they’ve been convicted of in the past? Evidence shows that Corporations do act like people. If others are watching and pointing out their flaws/mistakes, they tend to self-regulate. Here is some research from Harvard Business School. Consumer demand/expectations are part of the equation but so is government oversight and transparency (a lot of which is brought to light through the media). In the current climate what has become clear is that consumers are demanding, media is reporting, however, government has not been scrutinizing. Hence, perhaps one possible solution to making Corporations more accountable and socially responsible might be, instead of creating a new legal structure, simply enforce the laws we already have in place. The report highlights negative effects the Green Revolution has had as well as discusses solutions/ways to avoid these mistakes moving forward. A strong case is made for what they call agroecology (organic farming methods in common parlance). It is the first report I’ve seen which takes into account geographic, climate & cultural differences between sub-Saharan Africa and Asian countries. The authors advocate for systems which allow farmers to share their knowledge & expertise amongst themselves instead of extension/”expert” based systems which tell farmers what to do. However, agricultural researchers are still needed to formalize the knowledge which farmers share/create. ICT is viewed as essential to making this happen, esp. to enable farmers to overcome institutional barriers (e.g. establishing information sharing networks, reducing the cost of searching for/acquiring information, linking farmers to markets & credit). There are a lot of highly pertinent sub-topics brought forth in the discussion so it is well worth listening to, in addition to reading the report. I have just had the deep privilege of assisting with the coordination and screening of the documentary Milking the Rhino at both Carnegie Mellon and Penn State universities. Penn State has created an Innovative Solutions Showcase. http://mtrsolutions.weebly.com/ Students were asked to create video pitches of no more than 3 min in length and to post them on YouTube. While this is the first year, it is hoped that next year others (other students, general public, entrepreneurs, etc) will join the competition. The following comment from Lisa Premo (Program Associate, Office of the Vice-Provost for Education) at Carnegie Mellon has prompted me to attempt to create this blog as an online forum whereby discussion can continue. An attempt to dispel the myth that the natural environment is a “free” resource. It creates an awareness that there is a delicate eco-system balance on this planet and the eco-system is not centered around humans but rather on the peaceful and collaborative co-existence between humans, wildlife, plants, insects, even microbes. Recognizing that (a) there is a cost to maintain the natural environment, and, (b) professional conservationists alone are not sufficient in number to protect all the natural resources on the planet, we need business models that create incentives for local communities (urban, suburban, rural, remote) to take ownership of and effectively maintain their local eco-systems. Across the globe, any time a community is given the label “poor” (based on their lack of monetary wealth), there is an unspoken assumption that they are also incapable of sound judgment let alone making sound business decisions. Hence the “poor” (in any part of the world whether in rural Africa or urban slum neighborhoods) are treated more like ignorant children than autonomous adults. It is expected that they will acquiesce and comply with whatever solutions and assistance are provided by the “more enlightened” people (i.e. people with money or certified education degrees). There is never an attempt to ascertain why certain behavior patterns or preferences have evolved over time. When people are “poor” it is automatically assumed that their modus operandi is either primitive or wrong. However, those who are considered primitive are able to construct housing that leaves zero footprint on the local environment (something that those with money and certified degrees have yet to figure out). Those in the US who were labeled as wrong for not wanting to invest their money in banks because of the excessive fees are now being proven right during the economic downturn as more and more “wealthy” individuals get hit with 30% interest rates and other onerous bank fees. It has often been said that societies are judged based on how they treat their least fortunate members. (see quotes http://ask.metafilter.com/23612/Quote-About-Government-and-Poverty) Within our country borders AND as a global community it is time that we put actions behind our words. The first step to respect is listening without judgment or bias. The second step to respect is asking others: How can I best help you? Instead of assuming one knows what is best for that person or group. Are movies truly educational or do they just serve to promote myths and stereotypes? Point: A film such as Milking the Rhino is just a snapshot in time. For those who are uneducated about foreign cultures it can reinforce negative stereotypes and beliefs (i.e. continue to promote ignorance rather than increase understanding). Counter Point: A film such as Milking the Rhino is an invitation for further dialog and informed discussion. It presents the complexity and depth of the issues so that we are forced to argue amongst ourselves. Through these arguments we will eventually increase our understanding and create better solutions. One polemic discussion leads to another. Point: Throughout the film, Africans refer to “white people” in a derogatory manner. This is offensive and why are we asked to help when they are so hostile to us? Counter Point: In the film, the Africans also state that “we cannot kill them [whites] and we must continue to live with them.” When it comes to Africa, as the film shows, there has been no shortage of derogatory and abusive treatment from whites to Africans. The Slave Trade, Colonial Rule, Exploitation of Natural Resources through lopsided contracts and trade agreements, constant biased media portrayals of “savages” and “primitive people”…The list is virtually endless. This behavior naturally generates deep resentment and anger. Anyone who is treated this way would react in the same manner. Instead of being surprised by the reactions, the reactions should be taken as a wake up call that the treatment of Africans needs to change. When this happens, their remarks will change. Can Technology help to reduce Human-Wildlife conflict? Is Development Aid a problem or a solution? Across the globe, development aid has had many mixed results. In some parts countries such as the Asian TIGERs have flourished. In many parts of Eastern Europe and Africa, the impacts of development aid and development policies by foreign donors have made things worse not better. For development aid to work, donors and technical assistance providers MUST learn to synchronize their interests with local interests in a manner that is collaborative and mutually beneficial. Within the context of Africa this means that, within each country, donors and technical assistance providers need to start sharing information about their projects with local communities AND with each other. Each country has an almost infinite number of projects on the same topic (wild life conservation, value added agriculture, HIV/AIDS treatment, small business development). There is no mechanism which provides a country-by-country across the board evaluation of which projects are working better within each sector/issue. In addition, the one-off pilot project approach needs to be replaced with a long-term intervention approaches (e.g. minimum of 10 year commitments to a project). 1 to 2 year pilots where activities stop as soon as funding stops are not helpful. In the context of development aid, we are not manufacturing widgets. We are working with individuals and groups of individuals to change behaviors and transfer skills (bi-directional, i.e. changes from donors to communities and from communities to donors). If the 1 to 3 year pilot approach is not adequate in any of these contexts, why is it then assumed that it is suitable for the context of development aid? Why are initiatives like these being spearheaded by foreigners instead of Africans? This question was raised by a Penn State student from Ivory Coast. He also lamented that he was the only African student at the Penn State screening. I can attest that at the Carnegie Mellon screening there was only 1 African student from Rwanda. Both universities have a much larger African student population. There is also a lot of African led research and activity that takes place within each country. Unbeknownst to many, Africa has a large and distinguished scientific research community as well as business community. If I had to answer as to why their efforts are not better known, I would say it is due to lack of marketing. Africans need to get better at self-promotion so that they are in control of the spin and the voices that are heard. While there are a number of people who prefer working in an office, I am increasingly amazed by the number of people who complain that work gets in the way of life. Those with children or someone in the family who needs frequent care/attention, those with medical conditions that flare up unexpectedly but are still able to be highly productive, those who face agonizingly long daily commutes and would rather use the 4hrs a day doing something more productive than travelling. To this list I must also add those with mobility limitations who have always had problems because buildings are not designed properly and do not offer as many customized accommodations as the ones in their own homes. Overwhelmingly I find people very much want to work and would view the opportunity to be productive from home as a huge perk (many would even take slightly lower compensation in exchange for the flexibility). I don’t know if anyone has studied this issue from a productivity and cost-efficiency perspective but I believe it is a huge missed opportunity for companies looking to reduce costs and boost productivity. Again, I haven’t seen studies to know whether this is fact or fantasy but I would love to find out! At first, the limitation was technological; but now it would be hard to find a company that does not have an office network, internet access and e-mail so this expense is already covered. Cellphones provide a manageable method of issuing and controlling phone costs. These days even the most basic computer can handle video conferencing. For some companies there are legitimate security concerns which prevent this from happening. Another security issue is branding and problems caused by those who misrepresent the company. My guess is that this type of person is a problem whether they are on-site or working at home. A good HR screening process and psychological profile should be able to handle most of the issues that come up. Aside from these two issues, and other than paranoia about employees not working (which I would argue can be managed by a clearly defined deliverable schedule and workplan), it would be hard to think of valid reasons not to give this a try. “American Express telecommuters handled 26% more calls and produced 43% more business than their office-based counterparts. In the hopes of saving one, maybe more…. Give us solutions not criticism!